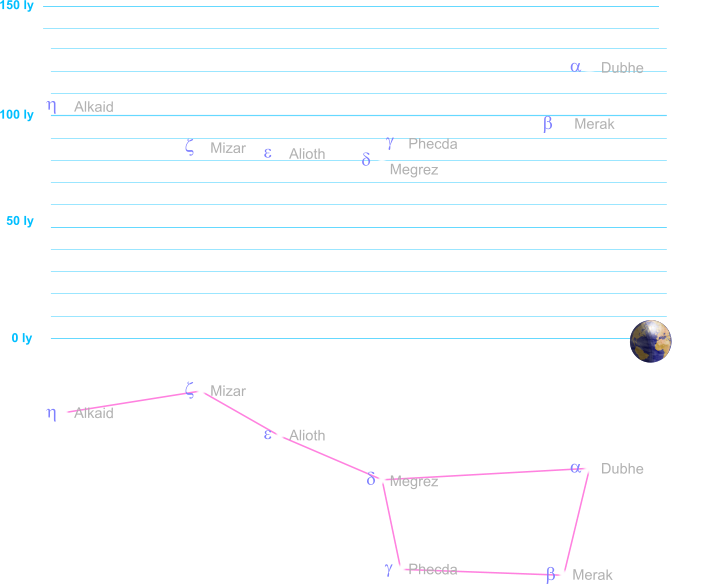 A group of seven prominent stars in Ursa Major (from east to west: Alkaid, Mizar, Alioth, Megrez, Phecda, Merak and Dubhe). Together, they form one of the most recognisable star groups in the sky. Seen from northerly latitudes, the Plough never sets, but swings slowly around the Pole Star every night of the year. Such a distinctive combination of seven stars has excited the imaginations of many cultures. Its association with a bear is seen across numerous societies, suggesting that the connection is very ancient indeed, though in modern terms these seven stars form only a part of the astronomical constellation of Ursa Major, the Great Bear (representing a part of its body and its tail). Historically the shape made by these stars has also been seen in many other different ways: as a cart or wagon, a cleaver or sickle, and many other interpretations besides. In the British Isles, it is commonly called 'the Plough', with the three eastern stars forming the handle and the other four the ploughshare. In North America, 'Big Dipper' is the more usual name, reflecting the shape of a dipper or ladle (and being the 'Big' Dipper in comparison to the Little Dipper, Ursa Minor, nearby to the north). The stars of the Plough belong to the northern sky, and rotate around the Northern Celestial Pole. Even its southernmost star, Alkaid (also called Benetnash, the 'handle' star of the formation) has a declination of more than 49°. This means that, for observers in much of the northern hemisphere, the Plough never entirely sets. For these observers, the formation remains visible in the night sky at any time of the year. The constellation of Ursa Major lies far outside the plane of the Milky Way, and so these seven bright stars stand out distinctly against the comparatively faint stars that surround them. Their distinctive pattern is therefore especially easy to locate, and a useful starting point for finding other northern constellations and objects, especially the Pole Star. The Plough's two western stars, Dubhe and Merak, point almost directly northward towards Polaris, making these Pointers invaluable in navigation. Unlike almost all other constellations and asterisms, the Plough is not simply an arbitrary collection of stars in the sky. Five of its seven stars are physically related to one another, and apparently originated from the same open cluster some 300 million years ago. Though they no longer strictly constitute a cluster, these five bright white stars still share a similar path through the Galaxy, and are classified as part of the Ursa Major Moving Group, or Collinder 285. Besides the familiar stars of the Plough, there are nine other less prominent members of this Group scattered through Ursa Major (with a lone member, DO Canum Venaticorum, falling within neighbouring Canes Venatici). The two remaining stars of the Plough, Alkaid and Dubhe, are respectively its easternmost and westernmost members, and form part of the formation simply due to their line of sight from Earth. The stars of the Plough vary in distance from the closest, Mizar in the middle of the handle, at 81 light years, out to 123 light years for Dubhe at the tip of the ploughshare. The brightest of the seven as seen from Earth is Alioth, the nearest handle star to the blade, and the faintest is Megrez, next westward from Alioth at the point where the blade and handle meet. Like all constellations, the apparent pattern of the Plough is in reality a line-of-sight effect, and the seven famous stars in fact lie at quite different distances from Earth. The closest is Mizar, 81 light years away, while the farthest is Dubhe, 123 light years distant. Seen from a location more than a few light years from the Solar System, the arrangement of this group of stars would be noticeably different (and indeed may not form a recognisable pattern at all). Several of the seven stars are double, and the most apparent of these is Mizar, whose companion Alcor can be distinguished by the naked eye under appropriate conditions. These two stars (known together as the Horse and Rider) are in fact the two brightest members of a complex extended multiple system consisting of at least six interacting stars. Another notable star in the Plough, far too faint to be seen by the naked eye, is HD 102956. This yellow star falls within the quadrangle of the ploughshare, and is known to have a planet in orbit. This planet, of the class known as Hot Jupiters, follows a rapid orbit extremely close to its star (at 0.08 AU, less than a tenth of the distance from the Sun to the Earth) which it completes it less than seven days. The Plough describes an area well outside the busy plane of the Milky Way, and it contains few notable nebulae. A significan exception is M97, the Owl Nebula, which falls close to a line between Phecda and Merak (that is, the base of the 'ploughshare'). This is a planetary nebula some 2,600 light years from the Solar System, formed by the expanding outer shells of a giant star. The patterns within those shells seem to form a pair of round 'eyes' within a wider circular structure, with the whole arrangement giving the impression of the owl's face from which the nebula takes its name. Centred the regions around Phecda is the Ursa Major Cluster of galaxies, which is divided into two Groups, North and South (the division is somewhat arbitrary, but very broadly, the Ursa Major North Group lies northward of the star, and the Ursa Major South Group lies to its south). The entire cluster forms an outlying component of the Virgo Supercluster some sixty million light years beyond the Milky Way Galaxy. Two of its most prominent members are both barred spiral galaxies: M109 (less than a degree from Phecda) and M108, close to the Owl Nebula in the sky. Near Alkaid at the end of the Plough's handle is a famous spiral galaxy that is unrelated to the Ursa Major Cluster, and only about a third of the distance from the Milky Way. This is M101, the famous Pinwheel Galaxy, so named because its spiral shape appears almost exactly face-on as viewed from Earth.